The Supreme Court yesterday fixed for support on December 4 the fundamental rights petition filed against the re-convening of Parliament. 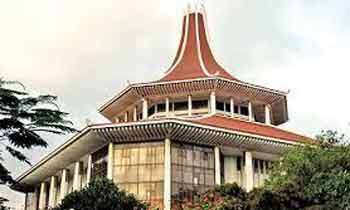 The Bench comprising Chief Justice Nalin Perera and Justice Lalith Dehideniya fixed the matter to be supported for granting leave to proceed along with the related petitions. Former UPFA MP Sarath Weerasekara filed the petition seeking a declaration from the Court that the decision taken by the Parliament Secretary General and the Attorney General to re-convene Parliament was unconstitutional. He said the SC had already issued an interim order staying the operation of a gazette proclamation issued by the President and that it could only be determined at the conclusion of the main matter and as such the petitioners in the applications are not entitled to claim the result of the final order from an IO. However, Parliament Secretary General had made arrangements to reconvene Parliament on November 14. Since Parliament continues to stand dissolved, neither the Secretary General nor the Speaker could summon Parliament before the final determination of the Court. The Speaker was also cited as one of the respondents. Parliamentarians don’t want to go to parliament! “So So Sri Lankan!! In the backdrop of the interim order, this application should be thrown out of the court as it is a fundamental breach of democratic principles of governance by consent of people, whose mandate must be fulfilled by the elected members executing their responsibilities through a functioning parliament!